DPA, 03rd DECEMBER, 2018 - UN Secretary General Antonio Guterres said that the world is “in deep trouble with climate change” at the official opening of a UN climate conference in Poland on Monday. “For many people, regions and even countries, this is already a matter of life or death,” Guterres told the representatives from just under 200 states who are taking part in the annual gathering, this year taking place in the southern Polish city of Katowice. “We are still not doing enough, not moving fast enough, to prevent irreversible and catastrophic climate disruption,” Guterres said. For two weeks, the delegates will be in Poland to focus on fleshing out the rules for financing and implementing the 2015 Paris agreement. The Paris pact provides an outline for countries working together to limit the Earth’s warming to between 1.5 and 2 degrees Celsius. Guterres said it was “vital” the Paris accord goals be met. Most efforts to prevent the planet heating up relate to stopping the release of greenhouse gases as soon as possible. However, the measures promised so far worldwide to reduce harmful greenhouse gases are far from sufficient to meet this goal. 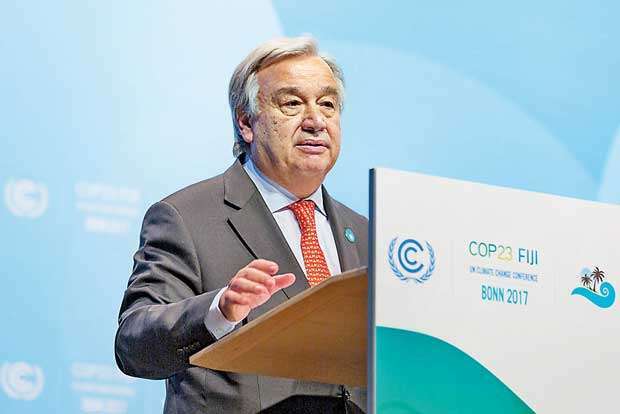 During his opening speech, Guterres underlined the importance of a collective commitment and “more action and more ambition” to prevent “global climate chaos” from ensuing.